This summer rising sophomore Mark Neuhengen will be studying travel literature in the original St. Ignatius College Library catalog. Mark is double majoring in History and Religious Studies with minors in Islamic World Studies and Arabic Language and Culture. He is excited to join the JLPP team and to learn all he can about how nineteenth-century Europeans and Americans saw and wrote about other nations. Ernest Hemingway, that icon of American literature, once said, “It is good to have an end to journey toward; but it is the journey that matters, in the end.” A quick overview of the “Travels” section of the c.1878 St. Ignatius College library catalog reveals a plethora of amazing and meaningful journeys. By looking at the destinations found in the titles, one can imagine the sights these European explorers must have seen in person, and readers experienced vicariously. One can only begin to imagine how explorers accustomed to the European and American countryside felt about exploring such exotic (to them) new lands as Palestine, China, Central Africa, and Iceland. Another important thing I picked up from the book list is the lack of female voices. Whether this is due to the patriarchal nature of nineteenth-century society or the lack of women on these travels will only be discovered out through more research. If I had to guess the reason why there are no women writers, I would say that it was because they did not travel. Using the little preliminary knowledge I have, I would assume that husbands would be wary of bringing their wives to faraway and potentially dangerous locations. This sentiment towards women can be seen as a sign of the patriarchy. I am usually against broad generalizations, so it may be possible that the Jesuits did not collect the writings of female explorers. The reason for this may relate to St. Ignatius College originally being a men’s college, and the Jesuits wished the students to be familiar with male literature. In light of this, I’m interested to see how these predominantly male explorers portrayed foreign women. Did the same societal conventions shape their view? One can relate this back to the study of “the other” mentioned earlier. A final aspect that I found enjoyable in the catalog was the inclusion of familiar American authors. Throughout the section I found works by Washington Irving, Henry David Thoreau, and Lewis and Clark. It is interesting that even by 1878 these authors were already becoming classic authors. While I am not familiar with him at the writing of this blog, the name Bayard Taylor appears nine times in a row. He should be someone to keep researching. I believe that the Travels section of the library catalog will be an interesting one to research over the next few months. I have a feeling that it will be intriguing to see how these European and American travelers saw their world. It should also be fascinating to see what they felt was important to include and to ruminate on what they felt was unimportant. In general, I hope you will join me on my adventure into the world of nineteenth-century explorers and missionaries — and the teachers and students at a Jesuit College that read about them! Did the Jesuits intend to found a law school in 1870? This is the second post in Senior English and History major Erik Berner’s series on his research into the Legislation division of the original St. Ignatius College library catalog this semester. First annual banquet of the Lincoln College of Law, St. Ignatius College. Held at the Great Northern Hotel in Chicago, Illinois, on February 12, 1909. 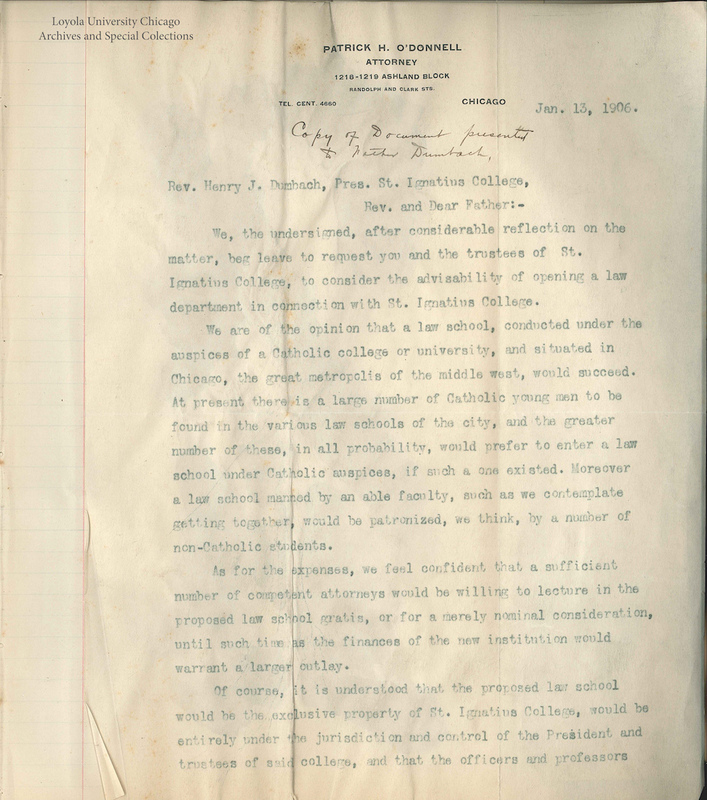 Students at Loyola had to wait nearly forty years after the 1870 founding for a law school. 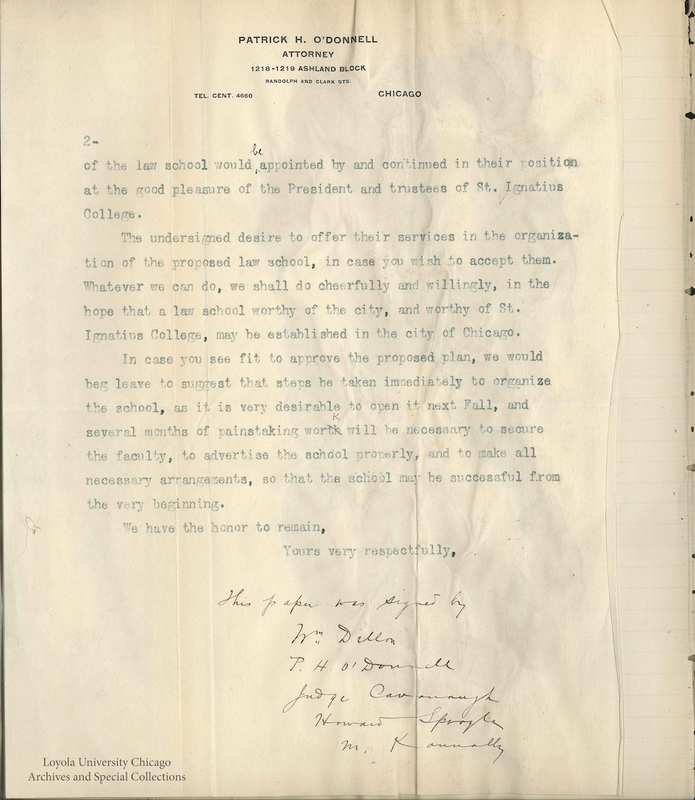 Collection of Loyola University Chicago Archives and Special Collections. So far, based on my research, I believe that upon the establishment of St. Ignatius College in 1870, the Jesuits had no intention of establishing what we would call today a law school. In order to understand why this is, I had to delve into the history of legal education in the United States. Key to my conclusion about the Jesuits initial intentions are three major threads: the state of law education prior to 1870 (both the year Loyola was founded and the year that marked the start of Harvard Law School’s method of “modern” legal education), the subsequent development of more modern and professionalized modes of legal education, and the history of Loyola’s own law school (which was eventually founded in 1908). The parallel founding of a law school at fellow Jesuit university Marquette in Milwaukee can help us conjecture the purposes of Loyola’s law school when it was finally established. Prior to 1870, law schools as we know them know, as entities affiliated with universities, were very few. The major method of legal education was through the apprenticeship system, which often produced lawyers of dubious quality. Apprentice standards and reading lists were far from standardized and bar admission officers were often more concerned with granting favors to their friends than with the quality of the lawyers they admitted to the bar. Supplementing this were some startup law schools of various educational methods not associated with universities and not required for admittance to the bar, as well as lectureships on legal issues at established colleges and universities that often served more to prepare students to proverbially “not sound like an idiot” when talking about law than to actually train lawyers. It was in 1870 that Christopher Columbus Langdell instituted his influential case method of instruction at Harvard, revitalizing the professional school within the university with a new pedagogical approach devoted to the production of lawyers trained on case precedents in the classroom rather than in the courtroom. Reactions to, and variations of, this mode would be integral in the subsequent founding of many other law schools around the country. Some were founded with the intention of being part of a university while others would later be subsumed by one. While St. Louis University’s law school dated back to 1843 and Georgetown launched its law school in 1870, the Jesuits in Chicago appear to have been focused on liberal arts education instead. It is likely that their collection of secular and canon law was more for their own philosophical and educational use; Jesuits are notorious for their desire to learn everything about everything, and teach it as well. The next question that I would ask about Loyola’s law school, founded when St Ignatius College became Loyola University in 1908, is what caused the Jesuits to wish to create it then? It is helpful to look to the north. The Jesuits were doing the same thing at the same time in Milwaukee. In 1908, Marquette also became a university, with a law school being established. 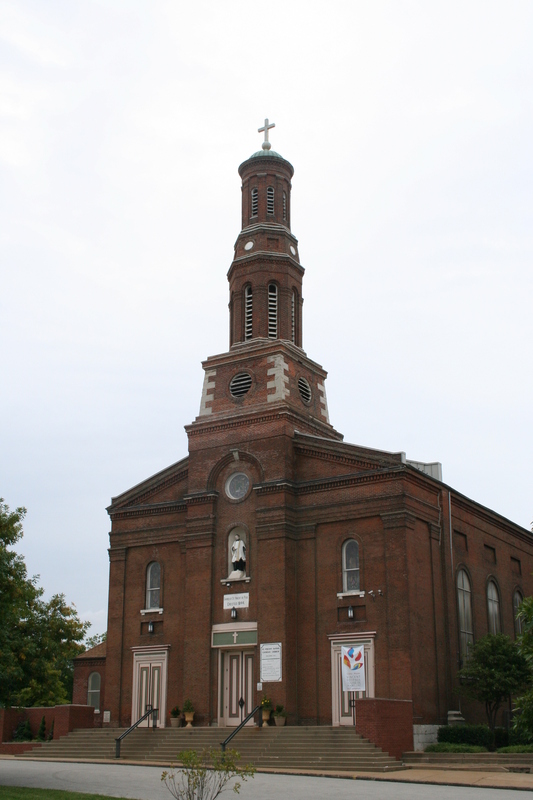 Both Loyola and Marquette’s schools were primarily night schools at first. According to Hugh C. MacGill and R. Kent Newmyer, Marquette’s law school was established to give often poor ethnic Catholics from Milwaukee a legal education (albeit, one that was viewed less favorably by the Anglo establishment) which was refused to them by the rural University of Wisconsin. The next step in my research about the history of Loyola’s law school will be to decide whether I think the same dynamic was happening in Chicago, in reaction to different influential Anglo-Protestant schools, Northwestern and the University of Chicago. Complicating Loyola’s perceived parallel to Marquette is the existence of the Illinois College of Law at the time, which would, in 1912, be subsumed by DePaul. I hope to gain a better understanding of the relationship between the two by the time I am done with my research. Want to learn more? Helpful readings include Robert Bocking Stevens’s Law School: Legal Education in America from the 1850s to the 1980s (Chapel Hill: University of North Carolina Press, 1983) and Hugh C. MacGill and R. Kent Newmyer’s essay, “Legal Education and Legal Thought, 1790-1920,” in the Cambridge History of Law in America Volume 2: The Long Nineteenth Century (1789–1920) ed. Michael Grossberg and Christopher L. Tomlins (New York: Cambridge University Press, 2008), 36-67. You can also find a short timeline history of the Loyola School of Law here. We are very proud to have reached an important milestone this past week: we uploaded the 5000th image on our Flickr site. It has been a little more than two years since we began tracking down and photographing books. I don’t think any of us expected to have accomplished as much as we did in the intervening time. The 5000th image is of A Treaty on the Holy Mysteries, a work on the Lord’s Supper by prolific French Vincentian Pierre Collet (1693-1770). Collet wrote theological treatises, ecclesiastical law texts, biographies, spiritual guides, and Anti-Jansenist works. A biography of St. Vincent de Paul by Collet was also in the library’s collection. Back in December 2015 we reached another milestone: we completed tracking down and photographing the 1750 titles that had been identified as books possibly in the original library catalog. We are still editing these images and generating metadata for them, and we will be posting them on the site for months to come. Analysis of these titles will take a little longer. We are also thinking about the second phase of the JLPP. More to come on that later! The Fall 2015 semester saw the largest number of undergraduate and graduate students yet — seven in total — working on topics related to the JLPP. Aaron Kinskey and Gustav Roman tracked down the final volumes from the original St Ignatius College library which Michael Albani processed, generated metadata, and uploaded. Kyle Jenkins, Brendan Courtois, Dan Snow, and Melanie Zagorski all undertook mentored research projects on topics as diverse as secondary education curriculum development, the history of library classification, and Jesuit financial systems. Aaron graduated at the end of the fall semester, but the other team members are continuing their work in the Spring semester. All current students will present at Loyola’s Weekend of Excellence in April. They are joined by two new team members: undergraduates Roman Krasnitsky and Erik Berner. Roman is working with Gustav on an exciting new project to uncover heretical books in the original library collection. Intrigued by the books in the Legislation Division, one of six divisions in the original library catalog, Erik is exploring those books on secular and ecclesiastical law to better understand why they might have been collected. Check back for updates on this site about how their research is progressing. The last week of January is always Book Week in New York, where bibliophiles from across the country and around the world descend on the city for a series of programs. The JLPP was ably represented at at a symposium at the New York Society Library on January 27th entitled Library Records in a Digital Age: A Symposium on Teaching and New Research. Project Director Kyle Roberts gave a presentation on the ways in which the JLPP has offered a range of experiential learning opportunities for Loyola undergraduate and graduate students interested in book history, library history, and the intellectual and spiritual history of Jesuits. Undergraduate intern Kyle Jenkins, a History and Secondary Education double major, presented on his project to develop curriculum that brings the JLPP into the high school classroom. His curriculum will be published on this site later in the spring. Both presentations were well received. Lauinger Library holds two important historic collections of Jesuit books: the original Georgetown Library, which is held in the Booth Family Center for Special Collections on the fifth floor, and the Woodstock Theological Library on the first floor. 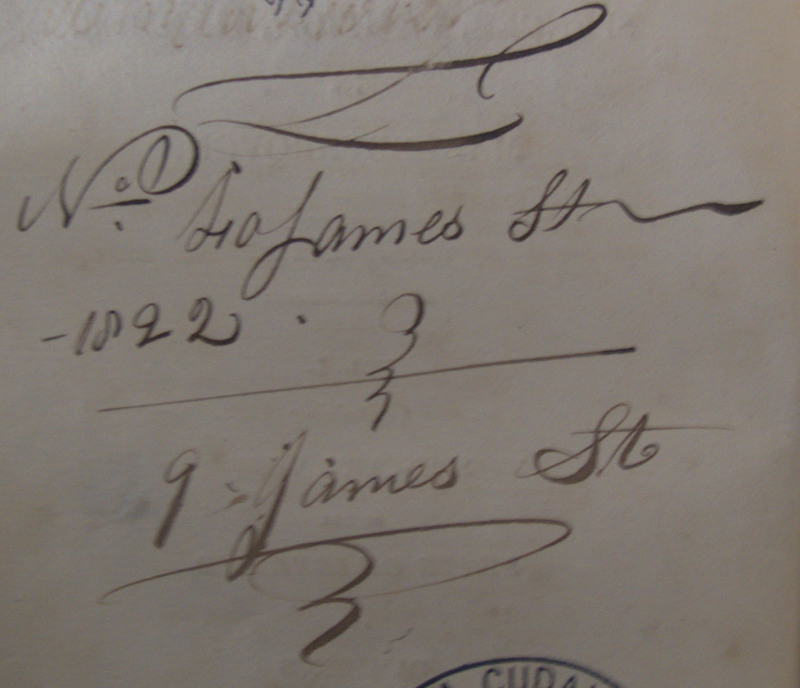 Both collections are filled with historic books with fascinating provenance marks. 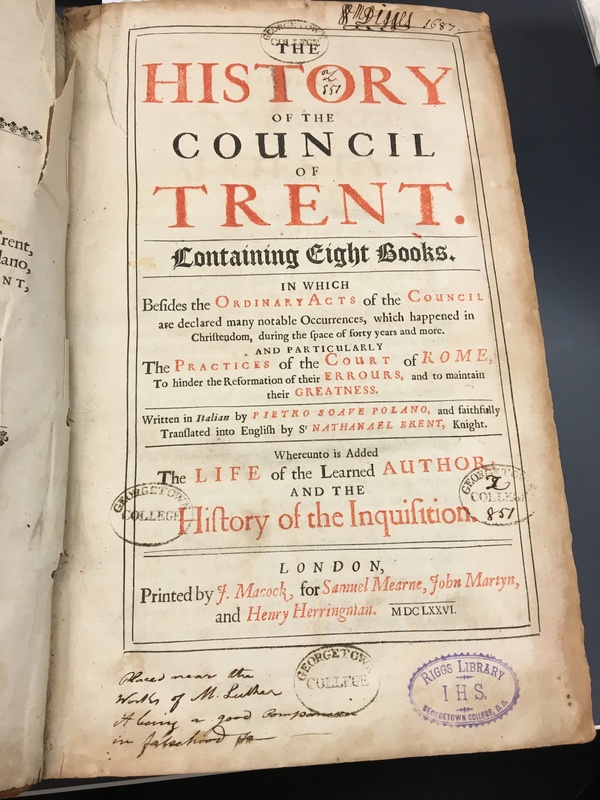 Karen O’Connell, Preservation Coordinator, and Asheleigh Perry, Metadata Librarian, shared a cover of a 1676 edition of Paolo Sarpi’s History of the Council of Trent from the original Georgetown Library with a fascinating piece of marginalia at the bottom! 1676 edition of Paolo Sarpi’s History of the Council of Trent with some handwritten advice about where the book should be shelved! St. Ignatius College also had a copy of this edition of Sarpi’s text which you can see here. It also had marginalia in it, but of a different kind. Readers of the JLPP blog who will be in Belgium this month will find there is an exhibition and a talk that may be of interest. The Provinciaal Cultuurcentrum Caermersklooster in Ghent is hosting the exhibition, The Call of the Rockies – Pieter Jan De Smet and the Indian Tragedy, from 2 February to 1 May 2016. 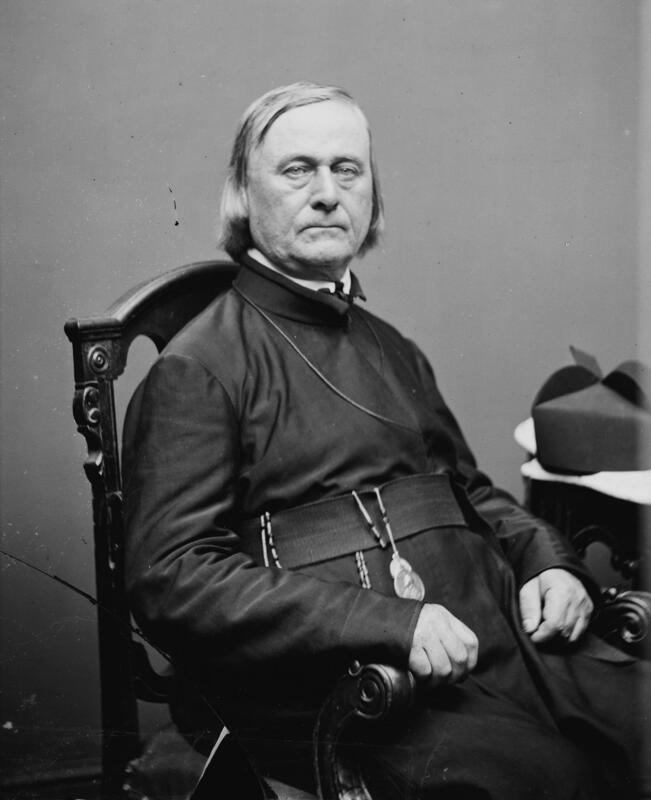 The exhibition focuses on De Smet (1801-1873), the pioneering Belgian-born Jesuit missionary who was one of the founders of the Missouri Province. This exhibition, which features items that were included in the groundbreaking 2014 exhibition Crossings and Dwellings at the Loyola University Museum of Art, explores De Smet “not only as a missionary, but also as defender of the Indians themselves, an advocate for peace and a mediator with the American government.” De Smet at first had attempted to establish the Rocky Mountain missions on the model of the pre-Suppression Paraguayan reductions, as Frederic Dorel explains in the forthcoming volume from the conference that closed the Crossings and Dwellings exhibition. That model failed, but De Smet spend his life working on behalf of native peoples. Admission to the exhibition is free. Thanks to David Miros, Archivist of the Jesuit Archives Central United States for a copy of the exhibition brochure. On 25 February 2016, Heinz Nauer of the University of Lucerne will be giving a paper in the Religion and Society Seminar Series at KU Leuven. 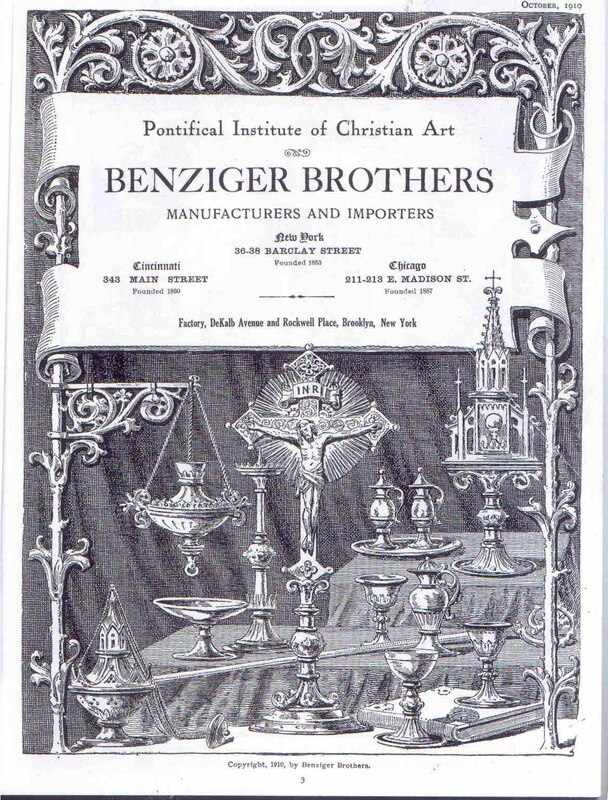 Nauer’s talk is entitled “Pious industry: The modern production of the Benziger publishing house in its international context, 1800-1920.” The Benzinger publishing house specialized in the production of Catholic prayer books, devotional images, and religious magazines. Initially based in Einsiedeln, Switzerland, the firm later opened branches in the United States, Germany and France. 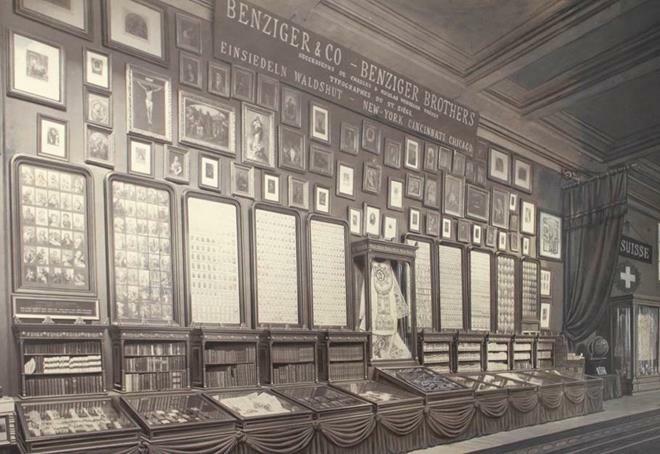 A leader in the mass production of Catholic media, Benzinger employed more than one thousand people in the nineteenth century. 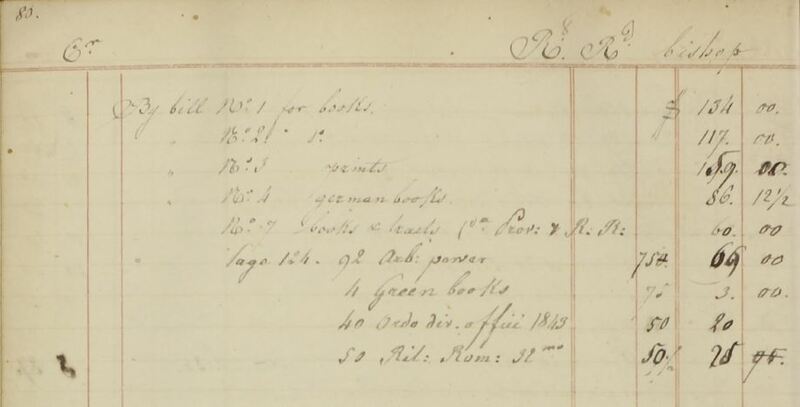 The JLPP Interns who have been studying the 1840s St Louis book trade ledger have uncovered that Jesuits ordered books from the Benzingers at Einseilden on seven different occasions. 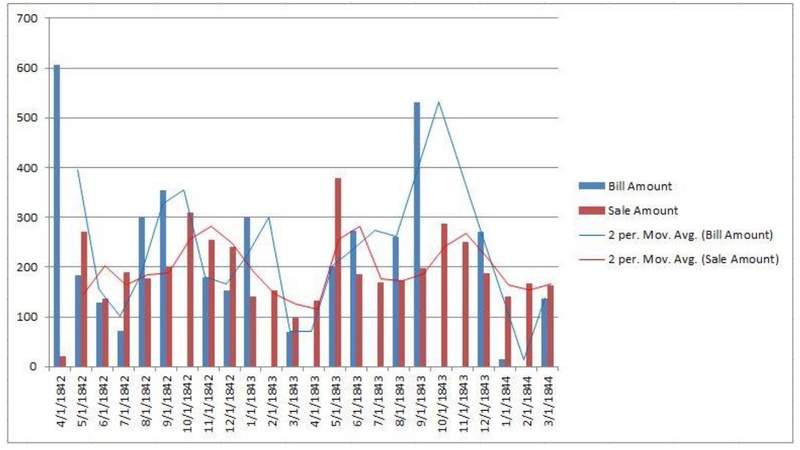 Each transaction lists the quantity, author and short title, and price paid for every book. One transaction alone goes on for seven or eight pages. Senior English and History major Erik Berner is researching the Legislation division of the original St. Ignatius College library catalog this semester. While this is the smallest of the catalog’s six divisions, it contains some unusual imprints and raises important questions about the origins and intended purpose of these books. This is the first in a series of posts Erik will be writing. Check back for updates! Initially upon looking at the list of sixty-eight titles (representing 123 volumes) of secular and ecclesiastical legislation, I was actually rather impressed. For the nascent collection of a new school that did not yet have a law school, it is fairly complete for what I presume an American Catholic school’s legal collection to contain. With the emphasis on the capitalized words in the previous sentence, the two strands of law that I imagine this collection to be focused on are American and Catholic (or Canon) law. The collection covers both of these bases to the standard I would expect from the time period. There are four rough categories of books that should be represented in an adequate law collection addressing the precedents and contemporary nature of American law in the nineteenth century. These are the three “early influences” that were, and still are, seen as the most important sources of inspiration for early American law: British, French, and American Colonial law. A fourth that I assumed I would see, due to its worldwide influence on Republican and Democratic theories, is Classical (Roman and Greek) law. Curiously, there is only one secular book from either of these civilizations (though many religious, which will be discussed later), and it is a Civil Law text from Justinian during the time of the Eastern Roman Empire, not a Classical book. Regardless, from New Haven colonial law, Constitutional interpretation, and American patent law, to two extremely old (sixteenth- and seventeenth-century) copies of the Magna Carta, bases appear to be for the most part covered. There is a curious French book from an eighteenth-century scholar that I can find no information in English on in a precursory Google search, Theodore-Edmond Olivier, called Traite elementaire d’economie politique. My basic French is not enough to get a thorough understanding of him from French sources that turned up. One of many volumes of Canon law in the Legislation Division. This one descended in Jesuit Province collections. In regards to Canon law, there is quite an extensive collection, which one would expect from a Jesuit college. A question that this raises for me is whether there was a Seminary already, or plans for one. I find myself most drawn to the fact, however, that a substantial amount of the Canon law books deal with the Council of Trent. I am interested in why. My guesses lie in the supposed relationships between this Council, the Counterreformation, and the Jesuits, but this is speculation. I am hoping that my research into this collection, as well as other classes I am taking, will help me better prepare for the possibilities of a life in legal studies. I find this unique library catalogue intersects with many of my bases of knowledge (libraries, American history, and Catholicism) and is a fantastic source to investigate. Aaron Kinskey, graduating History major and Fall 2015 intern, provides this exploration of one of the earliest books in the St. Ignatius College Library, Bede’s History of the Church of England. I have been working with the Jesuit Libraries Provenance Project this semester pulling books, photographing provenance marks, and editing digital images as we complete tracking down the original books in the c.1878 library catalogue of St. Ignatius College. I have also researched pre-1700 holdings in the catalog, a task which has been incredibly rewarding as a medievalist. One of these books, a 1565 copy of Bede’s History of the Church of Englande, offers many insights as a work translated and edited by a Roman Catholic Englishman, Thomas Stapleton, during the Reformation. Stapleton’s translation of Bede’s History of the Church of Englande stands out as one of the few works in St. Ignatius’ pre-1700 collection which were originally written in the Middle Ages. Of the few that are, they were written at the beginning of that period, like Boethius’ De Disciplino Scholarium, completed in the early sixth century, or the end of that period, like Ambrogio Calepino’s En tibi opt. lector Dictionarium linguae Latinae, completed in the fifteenth century. Primarily, the St. Ignatius collection is comprised of classical works by authors such as Plutarch, the Greek historian and biographer, and Cicero, the Roman orator or sixteenth-century authors such as Franciscus Titelmans, a Franciscan dialectician, and Martin Luther, the Protestant reformer. As the St. Ignatius collection includes many medieval works published after 1700, this could mean that during the sixteenth and seventeenth centuries, printers and publishers were not as interested in medieval works, and were focused on classical learning, as the traditional Renaissance narrative goes. It could also suggest that the Jesuits were not willing to go to great lengths to acquire rare medieval texts, or simply preferred rare classical and Renaissance texts. Additionally, Bede is the only English author represented in the pre-1700 segment, but he is also possibly the most highly esteemed medieval Englishman by the Catholic Church. Bede’s Ecclesiastical History was a work used to legitimize Catholic and Protestant arguments about the roots of the English Church. Ultimately Catholics were better able to utilize Bede’s devotion to Rome to support their arguments during the Reformation. The text was first printed c.1475-1482 in Strasbourg (Frantzen, 236). A new Latin text was published in Protestant Basel in 1563 and in response, Catholics at Louvain reprinted the work soon after. Two years later, Stapleton went much further and translated the work so that it was more accessible to the English-speaking public, and had it published in Antwerp (Heal, 121). Stapleton’s translation was the first modern English translation of Bede’s work, demonstrating how important this text was in the religious debates of early Reformation England. His work was a response to the ideas of John Bale and John Foxe who had used Bede to claim the church was a pure English church, not a Roman one (Frantzen, 236-237). Thomas Stapleton’s 1565 edition offers insight into how English Christian history could be utilized by Catholics and Protestants to demonstrate their faith’s superiority. Thomas Stapleton believed that the Elizabethan Protestants were in error in believing there was a pure British, or English Church. They argued that there was a preexisting British Church which had been corrupted by Roman customs. 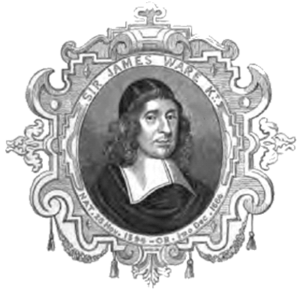 He attempted to prove that Roman Catholicism was the original faith in England, and did so not only by providing a list of errors in the book, but by providing a gloss next to key passages in the text. 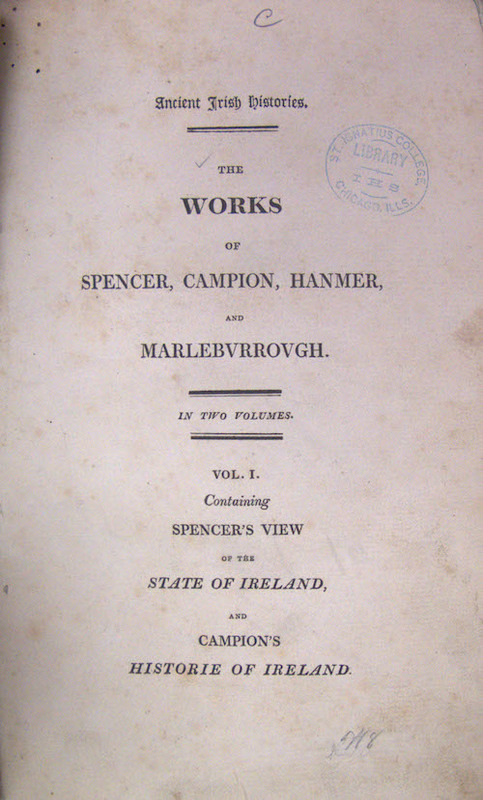 Stapleton states in his introduction, “I have gathered out of the whole History a number of diversities between the pretended religion of the Protestants and the primitive faith of the English church.” This demonstrates that he was using this text to reject Protestant claims to historicity. This introduction is addressed to Queen Elizabeth I herself, attempting to convince her that Catholicism is the true and orthodox faith of England. One of the sections of Bede’s History which had been used by Protestants to lay claim to a pre-existing British Church was that of the Synod of Whitby of 664. This synod came about when there was a disagreement among the Northumbrian nobility over the proper dating of Easter. The Ionan custom, which was used by the Bishop of Lindisfarne, Colmán, and his monks, had been adopted by King Oswiu of Bernicia and celebrated Easter at the time of Passover. The Roman custom, celebrated by Oswiu’s wife Eanflaed and Alchfrith, Oswiu’s son and sub-king of Deira, however was gaining popularity. This difference caused much confusion and tension among the nobility because they were celebrating Lent and Easter at different times, and Alchfrith even drove the Ionan monks out of Ripon to replace them with Wilfrid and Roman Benedictines. Thus, the Synod of Whitby was called “to keep one rule in serving the same [God], nor to vary here in celebrating the heavenly sacraments” (III. 25, p. 102-3). Sixteenth-century Protestants such as the Presbyterian George Buchanan identified the Ionans as the anti-Roman, anti-establishment Christians who were defending their traditions against the Roman Church. He viewed the defeat of the Ionan tradition as “the legacy that the Church of Columba bequeathed to the Church which was to be built at the Reformation upon the ruins of Rome, and which has been completed in the Church of Scotland” (Wormald, 207). Buchanan thus saw the Reformation, and especially the Presbyterian Scottish Kirk, as the continuation of early British Christianity. Stapleton however, was mostly directing his criticism at Anglicans like John Foxe and John Bale, whom he mentions in the introduction. In a 1570 edition of Foxe’s Acts and Monuments, Foxe emphasizes King Oswiu’s decision to choose the Roman custom as symbolic of the royal power over the Church rather than identify the Ionan Christianity as the true British faith. Although this was written after Stapleton’s 1565 edition, he may have been aware of the Protestant viewpoint on this issue. Stapleton’s gloss does not directly address Foxe’s stance, but does however focus on the role of the king in relationship to the Roman Catholic Church. In this section of Bede’s text, Colman and the Ionan party claim that they received their customs from St. John the Evangelist, and therefore practice the original custom. In response, Wilfrid draws upon the Petrine supremacy and states “if your father Columba…were holye and mightye in miracles, yet can he by any meanes be preferred to the moste blessed prince of the Apostles…?” contrasting St. Peter, the founder of the Catholic Church, with St. Columba, the founder of the monastery at Iona (III. 25, p. 106). Following this, King Oswiu demands to know if Peter was actually named the rock of the Church by Jesus, to which the Ionan party concedes. Oswiu logically concludes that the Petrine tradition must be supreme. Next to this passage Stapleton’s gloss states “note the conclusion of the kinge,” to emphasize how this chain of logic convinced the Bernician king that the Roman tradition was the correct one (III. 25, p. 106). There is some suggestion in Bede’s text that King Oswiu is ignorant of Catholic doctrine and history because he has to ask Bishop Colmán if Peter was truly the rock of the Church. Bede may have depicted Oswiu this way to show how a fresh mind, uncorrupted by knowledge, could choose the correct tradition by using simple logic. Stapleton, by drawing attention to the king’s decision, may have been drawing on this notion or just simply showing that one of the earliest English kings of the most powerful kingdom in Britain at the time chose the Roman tradition of Easter dating, and thus connecting Englishness with Roman Catholicism. Stapleton’s strongest yet simplest observation about the decision to choose the Roman dating is when he writes “this manner is observed nowe uniformely in al Christendome,” reminding the reader that it is the Roman tradition which even the Church of England follows (III. 25, p. 105). While Easter dating is not at the core of Stapleton’s concerns, he is showing that the Church of England is indebted to the Roman Catholic Church and a Catholic king. Easter is arguably the most important feast of the Christian faith, and its dating is crucial to the rhythms of a Christian life. Stapleton is following his agenda of finding the roots of English Christianity in the early Catholic past. The Synod of Whitby has largely been exploited by editors and translators as well as Bede himself to legitimize one tradition over the other. This seemingly trivial Easter dating controversy bore much fruit in competing Catholic and Protestant claims for superiority during the Reformation. The Jesuits at St. Ignatius College likely had a copy of this work for two main reasons: to own a copy of the first modern English translation of this work and because they knew and wanted to communicate that England was originally a Catholic nation. As the United States was primarily English-speaking, to have an English language copy of the text was also logical. Stapleton was a Jesuit novice for part of his life and an accomplished theologian at the University of Louvain, a center of Catholic learning. Stapleton is representative of a group of English Catholics who lived in exile on the Continent to write and teach after refusing to swear the Oath of Supremacy (François, 367). He was a great writer who translated an important book for the Catholic historical corpus that could be found on a library shelf in Chicago’s Jesuit college. Want to learn more? You might check out the following: Allen Frantzen, “The Englishness of Bede, from then to now,” in The Cambridge Companion to Bede, ed. Scott DeGregorio (Cambridge: Cambridge University Press, 2010), 229-242; Felicity Heal, “Appropriating History: Catholic and Protestant Polemics and the National Past,” Huntington Library Quarterly 68, no. 1-2 (March 2005), 109-132; Patrick Wormald,”The Venerable Bede and the ‘Church of the English’ ,” in The Times of Bede: Studies in Early English Christian Society and its Historian (Malden, MA: Blackwell Publishing, 2006), 207-228; and Wim François, “Augustinis sanior interpres Apostoli. Thomas Stapleton and the Louvain Augustinian School’s Reception of Paul,” in A Companion to Paul in the Reformation, ed. R. Ward Holder (Leiden: Brill, 2009), 363-388.